Spike Island After Dark returns with events in March and April. The Spike Cinema Club will run another scary movie evening on Saturday March 03rd, with a screening of the Conjuring. And on March 24th and 31st the ever popular After Dark tours will continue, with our guides taking visitors on a 1300 year journey that includes captain and convicts, monks and madmen, sinners and saints. Sit in a solitary cell, walk an abandoned prison and experience a place with living history. 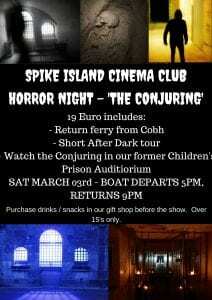 Advance booking only, see https://spikeislandcork.digitickets.co.uk/tickets for times and sailings.